John Bowman sat inside his mansion as evening fell and the light between the Vermont hills faded into dusk as he had done hundreds of times before. He had finished his dinner early and the servants had all gone their respective ways, back to their own homes in the village. He was alone in the house. As the light dimmed and the colors began to disappear, he couldn’t help but look out his parlor window toward the cemetery across the road. He lingered there for a long while, wondering, thinking…feeling. Would it happen tonight? Please, God, he thought, let it be tonight.As he wondered, the light of day finally shed its last rays and vanished. He was in the night country now. The moon was playing hide and go seek with the clouds, dark as pitch one moment and in the next, the entire countryside was awash with lunar light. How many times had he sat here, looking out where they lay? Had it really been years? So long to wait for a single, simple thing. The pain in his heart was as fresh as the day it happened for each of them, first his little baby daughter, then his 22 year old daughter Ella, cut down by sickness in the prime of life, followed only a year later by his beloved wife, Jennie. With her passing, a large part of him died, too. They had meant everything to him: they had been his world. Now, all he had were his memories and a belief in something extraordinary, something he held close to his heart like a treasure, telling no one. Cuttingsville, Vermont is part of the slightly larger town of Shrewsbury,on Route 103. 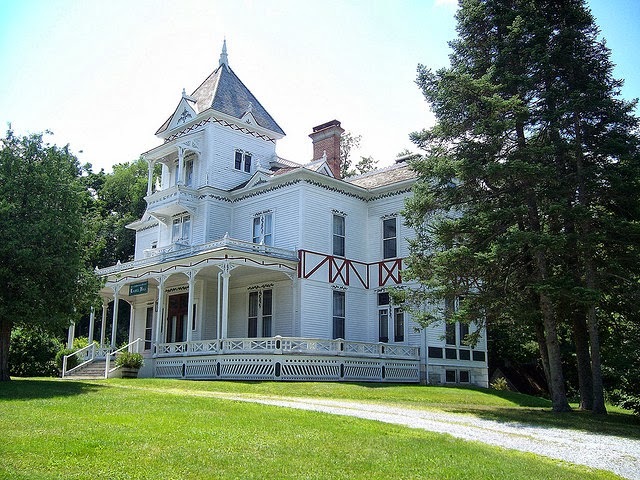 Like many New England towns, there isn’t much of note, nothing out of the ordinary that would catch your eye except for the Laurel Glen Cemetery and the stately Victorian mansion known as Laurel Hall directly across the road. You might drive by and give it a double-take: have you just seen a ghost in mid-daylight, lingering in front of the Bowman Mausoleum? No, you haven’t. What you have seen is a fine marble sculpture of John Bowman himself kneeling in front of the doorway to the family tomb. He is clutching a key in one hand and a flowered wreath in the other. The little stone structure seems quite out of place amid the other simpler stones erected in the modest cemetery. Designed and completed in 1880 by noted New York architect G.B. Croff, the Bowman Mausoleum may be the most heart-rending and expensive example of a belief in life beyond death ever constructed in New England. The story begins when fifteen year old John Bowman learns a trade. He apprentices out as a worker in a tannery in Rutland and then moves to New York state to learn the business. In the middle of the 19th century, leather goods helped hold the country together, used in almost every industry imaginable, from leather belts that drove the machinery of the New England mills to the rigging for ships and for all manner of horse-driven contrivances. In the next few years, the American Civil War would increase the demand for leather goods so such a degree that it could make a modest man rich, if he had the inclination to invest in his business. Bowman does so well that be moves back to Shrewsbury. He prospers and participates in local politics. With proserity comes a wife and family and all the happiness that a man might hold dear in his heart and be thankful for. So many Americans would lose loved ones during the war that it seems almost no one in the country was untouched by the conflict in some way. Everyone knew someone who died in that war. John Bowman may have wondered in those early days how he had been so fortunate. He had it all, it seemed. But no one escapes the trials of this world unscathed and for John Bowman, his dark night of the soul would arrive again and again over the coming years. Five years after marrying Jennie Gates from Warren, New York, the couple was blessed with their first child, a girl named Addie. Although we do not know the exact circumstances of her life, we know that young Addie only lived for four months. The couple was obviously distraught but the death of children was a more common event in the 1850s than it is today, as evidenced by the sheer number of childrens’ headstones found in any cemetery of the time. Large families were the rule rather than the exception and the multitude of childhood diseases meant that it was common for families to lose a child to one of them. But that didn’t make their loss any less poignant. The couple had another daughter, Ella, born in 1860. They lived in relative comfort and happiness, one must assume, for he was the most prosperous man in town and they must have wanted for nothing. It was during this time that Bowman was elected to the Vermont state legislature. 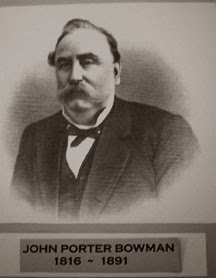 The war ensured Bowman’s fortune. For many years, the family prospered. But tragedy loomed ever on the horizon and when 23 year old Ella fell ill and then died in 1879, Mr. and Mrs. John Bowman’s world fell apart. None of the money mattered. Their two children, the light of their lives, were gone. Then, when it may have seemed like nothing could make anything worse, Mrs. Bowman fell ill and died a year later in 1880. John Bowman was alone, utterly and completely alone. John Bowman needed a purpose, something into which he could pour his anguish and his considerable fortune to help him find a reason to go on. This was a time in America when the business of memorials was in full swing. People tended toward the sentimental and spent long hours contemplating death, erecting memorials, and for some, attempting to speak to the dearly departed. The Spiritualist movement had started not far from Cuttingsville in upstate New York where Bowman had apprenticed as a young man. Perhaps in his formative years he had met someone involved in the movement, had heard of those people conversing with the dead. There is no proof of this connection but talk of the new movement was everywhere.It gave hope to so many who had lost so much. In the 1880s, funerals were productions and even the afterlife, it seemed, was affected by the wishes and longings of those who survived. People were seeking a closeness in death like the one they had in life. Bowman determined to build a mausoleum unlike any other. Many of the larger cemeteries of this time saw a number of extravagant tombs built from imported Italian marble. Also in place were any number exquistely carved angels, shrouded figures in mourning, and other human forms set in stone to last the centuries. Bowman wanted both.The Laurel Glen Cemetery at Cuttingsville was a simpler place, with rows of white marble slabs hewn from the nearby hills as the only makers of the good people who rested below. Bowman would change all of that. He would build a structure to last the ages. Money was no object. Tons of marble were imported from Italy and cut to fit the designs of architect G.B. Croff from New York. When it was completed, people began to visit and wonder at the structure, a tiny Grecian Temple nestled between who Vermont hills. The doors were opened and Bowman, pleased that so many were taking an interest in his project, hired a keeper and set up a guestbook inside. 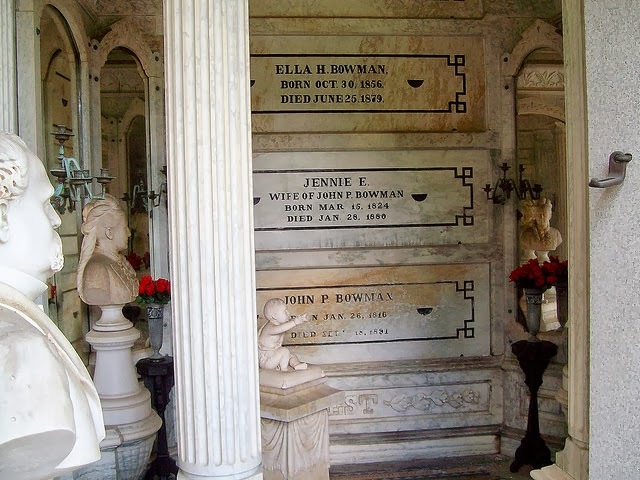 For awhile, the Bowman Mausoleum was a tourist attraction. Perhaps people even brought the kids. As the people came to visit and as time continued to pass, Bowman had another idea. He decided to build a large Victorian house almost directly across the road from the mausoleum. When completed, he moved into it, so close to the mortal remains of his beloved family.He named it ‘Laurel Hall’. It must have been a comfort. We don’t know exactly how the idea came into his mind, but once conceived, there was no stopping its realization. Bowman must have looked out that window a thousand and one times and seen something that no one else could see, a figure of a man begging to be let into the sanctum and be reunited with the only people who brought him comfort and solace.There he was, kneeling, holding a key to the door or was it to the life beyond? He could see it was, of course, his own figure kneeling there in the moonlight, looking longingly into the crypt. Other people needed to see this solitary, eternal mourner, too. So he hired an Italian sculptor named Giovanni Turini to carve his image into stone and place it on the steps, kneeling, entreating entrance into that glorious afterlife where he could be with his beloved family again. If that was the end of the story, it would be enough to make us wonder at the man’s pertinacity and devotion. But there’s more. There’s always more. As he settled into his life in the mansion, he spent less and less time outside of its walls and it become more and more of a tomb for him. He had servants, of course, but their nature was as taciturn as any Yankee. No one knew for sure what was taking place inside the walls of Laurel Hall. Rumors began to spread about the peculiar doings inside. He had the table set for his whole family. Beds were turned down for them. Though he ate alone, he lived as though he was whole again and the family was still with him. Rumors persisted that Bowman was studying the occult sciences, that he was seeking a way to come back from the dead and, one might assume, bring his family back with him. He grow older and more and more isolated. We can imagine him making the occasional journey across the street, opening the door with the real key and sitting amid his departed family, the carefully arranged mirrors reflecting his image over and over in the small space, making it seem enormous and empty, showing rooms beyond that simply could not exist in this world. The mirrors are situated to make the little room seem enormous, showing entrance ways to other rooms, branching off in a hundred different ways. Did he sit there quietly and seek to wander those rooms in his mind? When he looked at the little marble statue of his infant daughter reaching her arms out to him, did he reach down to gather her into his arms? His wife’s elegantly sculpted face gazed at him with empty eyes – or were they full of love for him? In the light of modern science, we can point to his depression and realize that, because it went untreated, it turned into a kind of manic obsession with death and the afterlife. When he died in 1891, according to local lore, his will stipulated that each night, the hearth fires would be lit. Funds were left to pay for the servants to continue their work of maintenance and cleaning of the house and the mausoleum. The bed linens would also be changed weekly and every evening, the table would be set for everyone in the family. Did Bowman know something the rest of us don’t? Why did Bowman ask for these strange requests? Why set the table and change the beds for people who obviously weren’t there? Was he getting things ready, just in case, somehow, he found a way back from beyond the veil? Would the family somehow appear or did he believe that, in fact, they had been there with him all along, at least in his mind: a baby girl who never grew up, a 22 year old daughter forever in the prime of her life, and a wife of many years whose love and support carried him through the hardest of times? Is it possible that he was never, truly alone, after all? Was it a kind of insanity for him to long for comfort and to imagine that those who had passed might actually be as close as his next breath? Who can say? He’s still there. 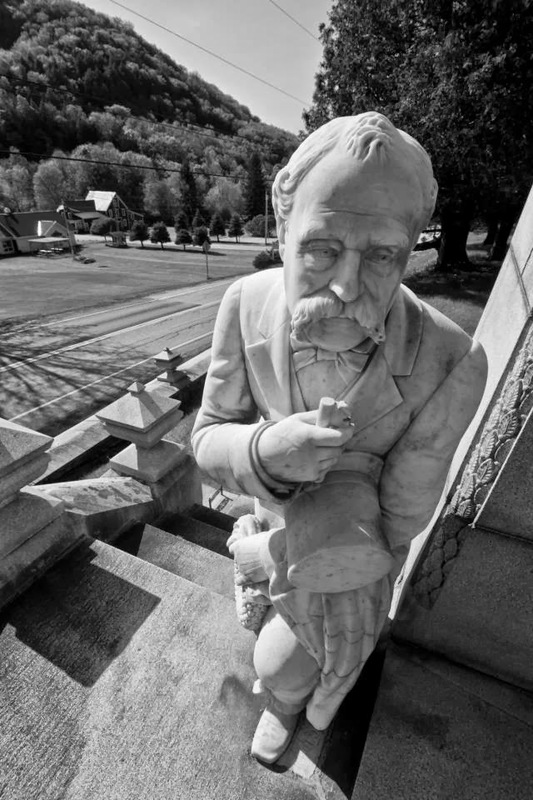 You can see him for yourself any hour of the day and night along Route 103 in Cuttingsville – the white and ghostly marble form of John Bowman, slightly larger than life, gazing into the sanctum where his two daughters, his wife and he are all resting the slumber of the ages. It’s an old adage that you don’t know what you’ve got ‘till it’s gone. One man’s monument to his family might make you realize how important family is in your life, after all.